We like things small. We prefer them invisible. Recessor offers the best of both. It lets MultiSensor 6 monitor 6 different points of intelligence in a room, and it lets it do it without reducing its accuracy or functionality. Itself only 4.4cm deep, Recessor snaps in place courtesy of 2 ingenious retainingspring clips. Those same springs of course allow for Recessor and MultiSensor 6 to be removed at any time without damaging your ceiling or wall. Whether it’s within a wall or in a ceiling cavity, Recessor lets MultiSensor 6 work its magic subtly. Monitor a full room with MultiSensor 6 using Recessor to install it within your ceiling. 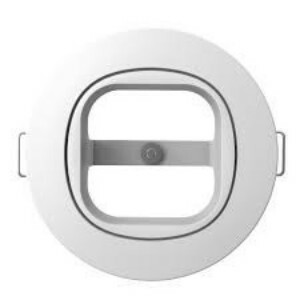 Use MultiSensor 6 as a beam sensor by installing it within a wall cavity using Recessor. Recessor has been designed to allow for a power cable to still be connected to MultiSensor 6 so that it can run without batteries. Recessor has also been designed so that it can be easily removed to allow for MultiSensor 6’s batteries to be changed every 2 years. Recessor doesn’t just convert MultiSensor 6 into a Z-Wave ceiling or beam sensor, it converts it into a precise sensor. Once recessed, your MultiSensor 6 can be angled up to 30ºwithin Recessor, fine tuning its measurements and readings to be just where you need them. After 3 easy steps, you’ll have Recessor installed within your wall or ceiling space. Make a 75mm/3″space for Recessor. Lock MultiSensor 6 in place. Insert Recessor-it’ll hold itself in place.